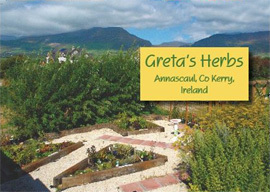 GRETAS HERBS is run by Greta McCarthy,O'Brien who qualified in Amenity Horticulture at the Botanic Gardens, Dublin in 1983. She was proprietor of Gretas Garden Centre in Bray and Greystones, Co Wicklow. She moved to Kerry in 1998. She has spent the last 10 years specialising in the growing and selling of herbs on the Dingle Peninsula. Presently she is running various garden classes at her Herb Centre in Annascaul. The Nursery is open from March to the end August. Business Hours: Thursday to Sunday 2-6pm other times by appointment. Retail Trade only. Red Mustard Greens, Rocket, Mizuna,Bunching onion, Chinese Celery,Sorrel, Chervil, Calendula, Nasturium. List Your Annascaul Business Here (Retail, Services & Accommodation) From €75 Per Year. Call Peter on 087 9767812 or Email Peter@StarterWebsites.net. "Contact us about advertising your accommodation, other business or group information here"
Content © Copyright www.Annascaul.net All Rights Reserved 2007 -2010. (Annascaul is also spelt Anascaul).